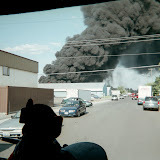 NARRATIVE: On January 16th, 2009 at 3:53 A.M. the Spokane Fire Department responded 3 engine companies, 2 ladder companies, a rescue unit and 2 battalion chiefs to a house fire at 3014 N. Cincinnati. Firefighters encountered flames coming from the roof area of a one and a half story house upon their arrival. A rapid and thorough search for victims of the home was begun and at the same time hose lines were stretched to the interior of the home where the fire was found to be rapidly extending into the walls and attic space on the upper level. It was then confirmed that all 5 occupants (two adults and three children) made their escape successfully from the home. It was however, discovered that they did not have a working smoke detector. A "knockdown" of the fire was achieved after 15 minutes. Crews remained on the scene for 2 ½ hours performing final extinguishment including searching for hotspots with their thermal imaging cameras. A total of 20 firefighters participated in controlling this fire. The Red Cross was summoned to the scene after it was determined that the smoke and heat damage was significant. The fire is currently being investigated by the Spokane Fire Department Special Investigative Unit and at this time, it appears that the fire may have been electrical in origin. The family of 5 will be taken care of by the Red Cross who will be providing lodging. It should be noted that this family did make it out of their burning home, however their smoke detector did not activate due to a poor battery. This family is very lucky to escape as they were sleeping at the time of the fire. Because most fire deaths occur from smoke in the home at night during sleeping hours, it is extremely important that a fresh battery be kept inside smoke detectors. Test batteries at least monthly and replace them at least once a year. Install smoke detectors on every level of your home. Smoke detectors save lives! PROBABLE CAUSE: The fire is currently under investigation by the Spokane Fire Department Special Investigation Unit. The focus at this time, is on electrical power as a possible source of the fire. DAMAGE EXTENT: The wood frame home suffered extensive damage to the upper level attic space and also sustained smoke damage throughout. Click on the link above to listen to all dispatch all the time. Why would you want to do a thing like that? Hey, I'm just telling you it's here. That's all! You might have to register. I don't know. INCIDENT ADDRESS: 1528 E Boone Ave. NARRATIVE: The Spokane City Fire Dept. responded fire fighting crews and their apparatus to 1528 E. Boone Ave. at 6:41 on the morning of Jan. 13th, 2009, for a reported structure fire. As fire crews were responding to this address they received additional reports from Fire Dispatch advising them that the four occupants of the structure had exited safely from the building. The first arriving fire crew reported that there was light smoke coming from the front of the structure and that they were preparing to enter to investigate for the cause of the smoke. Eventually two more fire fighting crews were assigned to assist in this investigation as they began arriving on scene. Armed with fire hoses, axes, pike poles, and thermal imaging cameras, these crews were able to dig out this fire from the walls and ceilings that were keeping it from being seen. Once uncovered the fire was quickly contained and extinguished by the crews who were inside doing their assigned work. There were no reports of any injuries to the fire fighters at the scene or to the occupants of the building. This particular house was divided into two apartments; an upper unit which was occupied by the building owner, and a lower unit occupied by a young couple and their infant. The younger couple is being assisted by the Red Cross as their unit will be without electricity until electrical repairs can be completed. The owner, who resides in the upper portion of the duplex, may have to make other short-term living arrangements as well. An investigator from the Spokane Fire Dept. 's Special Investigation Unit was on scene shortly after the fire had been extinguished and his preliminary investigation has focused on the electrical system in the building as being the probable cause of this early morning fire. Damage to the structural members of the building was kept to a minimum since the fire crews were able to expose the fire and extinguish it before it could get a good foot-hold on the structure. Once the electrical repairs have been made and other additional interior repairs are finished, the house should once again be habitable. PROBABLE CAUSE: The electrical system in the house is the apparent cause for the fire. DAMAGE EXTENT: Damage to the electrical system is severe, structural damage was fairly slight, limited water damage, some smoke damage throughout the building, and some interior cosmetic damage was caused by having to breach walls in the search for the fire.